Good Ol' Wishy's is an ice cream shop that offers many different ice cream options, including soft serve, over 35 flavors of hard ice cream, cone options, milkshakes, floats, old fashioned ice cream sodas, and sundaes. Also, many of the same dishes used for shakes and floats are also available for purchase in the store along with pint glasses, frosted mugs, coffee mugs, and t-shirts in various colors. Wishy's is also home to our "Good Ol' Spokes" Bicycle shop. We do repairs, equipment & parts sales, and carry all types of bikes like mountain, hybrid, fat tire, and road bikes! Nestled between the Tug Hill Plateau and the Adirondacks Mountains, tucked within the Black River Valley you will find Hidden Pastures Dairy. This quaint little goat farm is run by the husband and wife team of Andrew and Blake Place. The Place family built their goat dairy farm from an idle dairy farm parcel. They worked day in and day out to create a parlor, milkhouse and create the set up needed to milk their goats. The farm is a Grade A dairy facility and is able to ship milk to neighboring creameries. 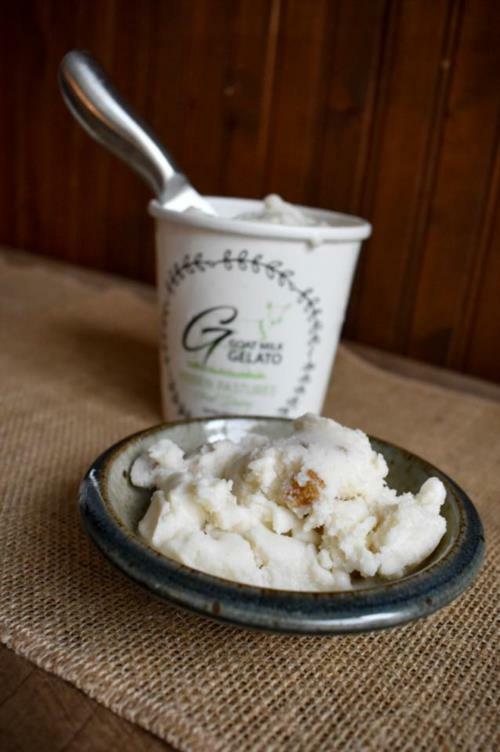 In 2012 Blake started dabbling with the idea of making goat milk ice cream and in the Spring of 2018 Hidden Pastures Dairy launched their Goat Milk Gelato product using their farm fresh goat milk! The dairy has a small farm store on site which carries local products and will be a part of the upcoming Lewis County Cuisine Trail. Store is open daily.